The post-it note treasure hunt last week has led to the children finding more uses for post-it notes than you can imagine. My house is covered in little squares of coloured paper, each with a little drawing or message scribbled on it. To continue the learning to read, we wrote body part names on some, and Z had to read them and put them on the correct part of his sister. Little S was quite happy to model for him, until it came to the one that said ‘chin’, we had to switch to a doll after that. 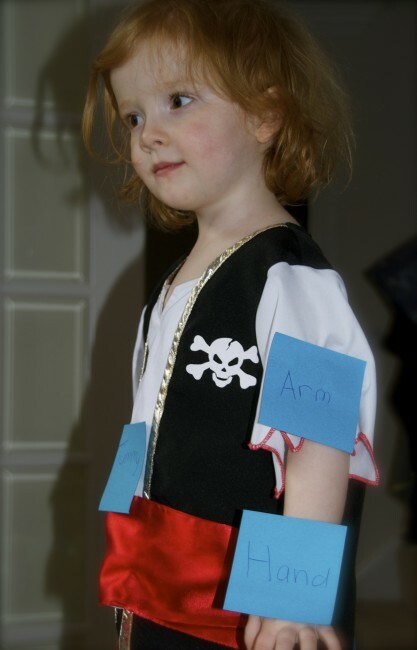 Here is Little S wearing Z’s pirate costume which is her current favourite outfit. They had a great time, even managing to sneak one onto my back, which I’m pretty sure was still there for the school run :-). Z was having so much fun with the game he didn’t notice he was reading words that were new to him. Does anyone have anymore fun reading activities for me? brilliant game….so why did chin cause problems? Great idea! As far as ideas go I think the more listening games the better, it all helps to fine tune the ears to hear the sounds in words. Oh gosh, that has to be THE cutest pirate I have ever seen!! 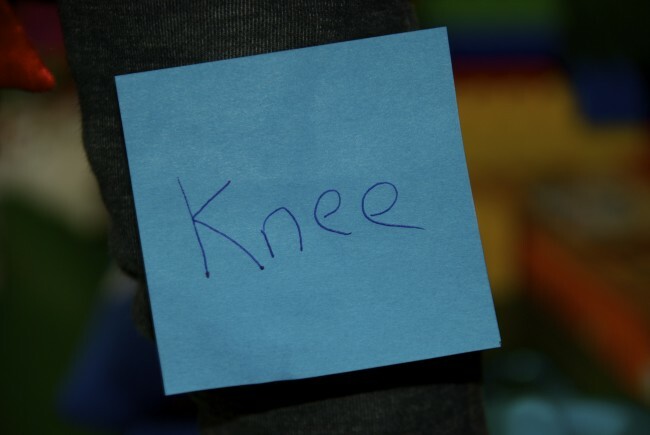 I love the post it idea too. What a fantastic idea to sneak a little reading into play time. Thanks for sharing on Monday Madness. i love it! what a fun way to add literacy to the day. It is still a genius idea, even reading it for the second time!